Tasting : Fruity and spicy. Did you know that? In the middle Ages, the black cumin was considered as a medicinal plant. Actually, this seed is rich in protein and mineral salts, such as calcium, sodium, and potassium and could help to strengthen the body's defences. It originates from Middle East and India, where it grows naturally. In India, the black cumin makes up part of various spice blends which people sprinkle on the Indian breads: naans. Use: the black cumin is a plant which is highly prized for its seeds which have a strong, spicy and peppery flavour. Besides, it can replace pepper. 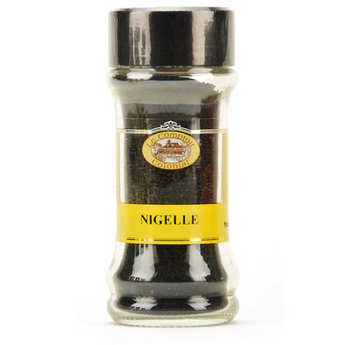 The black cumin goes very well with vegetables and yoghurts. To let out the beautiful flavoured notes, roast the seeds of black cumin then grind them finely.